A Director with the firm, Victoria Syvret works alongside John Burd in the Family department. She is highly experienced in all areas of Family work including Divorce proceedings, Children’s matters and Domestic Violence. Victoria attended Wirral Grammar School for Girls and graduated from Liverpool University with honours. She then continued her studies at The College of Law in Christleton, Chester, leaving with a Postgraduate Diploma in legal studies before qualifying as a solicitor with Burd Ward. Victoria enjoys assisting clients in the Family department and manages the Domestic Violence helpline which is available 24 hours a day. 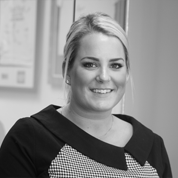 Victoria also deals with Private client matters including Wills and Probate, Conveyancing, Lasting Powers of Attorney and Court of Protection issues. She is a qualified Mediator and undertakes mediation sessions as a means of helping to resolve disputes between two or more parties. For more information about our Family Services please see our dedicated section of the website or contact the office for assistance.